West Haven, Connecticut - Saturday, January 5, 2019: John D'Errico of Notre Dame H.S. of West Haven, right, takes a penalty shot for a score against Jake Walker of Fairfield Prep, left, during second period hockey Saturday at the Bennett Rink in West Haven. Kevin Barrett, Notre Dame-Fairfield: Scored in overtime to beat Simsbury 5-4 in a game the Lancers trailed 3-0 and 4-3. Brendan Carney, Fairfield: Two goals and an assist in a 5-2 win over Amity. John D’Errico, Notre Dame-West Haven: Assisted on the tying goal and scored the winning goal in a 2-1 win over Xavier. David Engstrom, Branford: Scored twice, including the game-winner, in a 4-2 win over Conard. Alex Ferris, Enfield: Scored two goals and added an assist in a 4-1 win over Chicopee (Mass.). Griffin Fitzmaurice, Hand: Scored three goals in an 8-2 win over Fairfield. Ryan Fleming, Watertown/Pomperaug: Made 26 saves in a 4-1 win over Branford. Rylin Fowler, Eastern CT Eagles: Made 33 saves in a 3-2 win over Sheehan. Nathan Loitz, Northwest Catholic: Hat trick in a 7-0 win over Greenwich. Chase Maxwell, Xavier: Hat trick in 4-1 win over Greenwich. Travis Nussbaum, JBWA: Scored four goals and added four assists in a 9-6 win over Northeastern. David Overbeeke, Wilton: Scored twice in a 4-2 win over Norwalk. Markus Paltouf, Newtown: Stopped 31 shots in a 4-3 overtime win over East Haven. Jared Pliszka, West Haven: Made 43 of 46 saves in Fairfield Prep’s 4-1 win. Max Sendley, Northeastern: Had five points, including a hat trick, in a 9-6 loss to JBWA. Sam Teel, Tri-Town: Late goal gave the Terrorhawks a 3-3 tie with Sheehan. Gavin Till, E.O. Smith: Scored three goals in a 5-3 win over Woodstock Academy. Jake Watrous, Guilford: Hat trick in a 5-1 win over East Haven. Mason Woods, Hall/Southington: Scored twice in a 4-2 win over Northeastern. Eddie Zelikman, Westhill/Stamford: Scored the tying and winning goals in the third period of a 3-2 win over Amity. Amity at Hand (Northford), Wednesday, 4 p.m.: Amity earned its biggest win yet, then lost three in eight days. It tries again against Hand, which comes off a huge win over Fairfield. Watertown/Pomperaug at Guilford (DiLungo), Wednesday, 7:30 p.m.: The second meeting between the two, among the tops in Division II; Watertown/Pomperaug won 3-1 Dec. 22 at Taft. Newtown at Sheehan (Choate), Wednesday, 7:30 p.m.: Sheehan has its first (modest) winless streak, and here come the Nighthawks, 4-1-1 in the past six. Greenwich at Ridgefield (Winter Garden), Friday, 4:30 p.m.: First game in nine days for the undefeated Tigers. Fifth game in 10 days for the Cardinals. Guilford at Amity (Bennett), Saturday, 1 p.m.: This week’s Guilford games could also start to shape the SCC Division II playoff picture. At least one good team could certainly miss out on the four-team tournament. Hamden at Fairfield Prep (Wonderland), Saturday, 1 p.m.: Like the Jesuits last week, Hamden comes back from a long layoff with a Wednesday visit to West Haven, then has a big game Saturday at Wonderland. 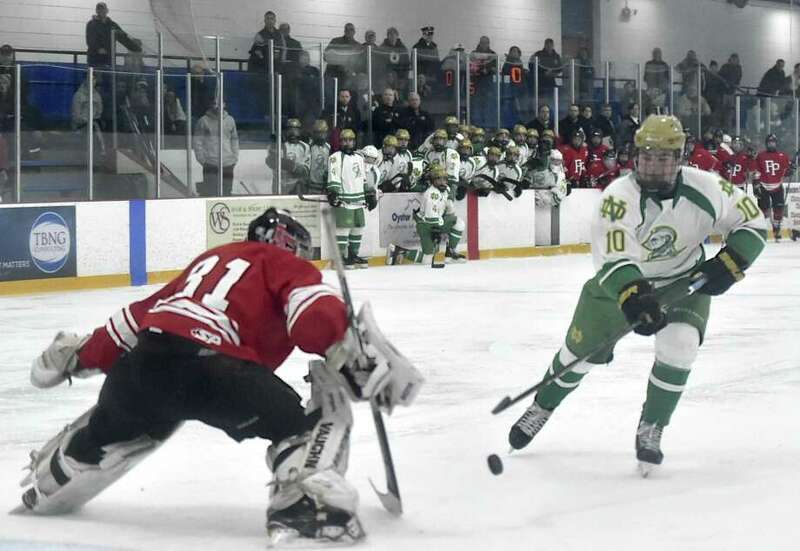 Northwest Catholic at South Windsor (South Windsor Arena), Saturday, 2:50 p.m.: South Windsor took the No. 3 Lions to overtime in their first meeting on Dec. 19. JBWA at Newtown (Danbury), Saturday, 6:40 p.m.: JBWA, averaging eight goals, have a tough week ahead, with this game in the middle of games against New Milford and LHK. Westhill/Stamford at Watertown/Pomperaug (Taft), Saturday, 7:30 p.m.: The Purple and Orange have won four in a row, including victories against Greenwich and Amity. This’ll cap a tough three games in four days, though, after Darien and Wilton. LHK at Sheehan (Wesleyan), Saturday, 8:30 p.m.: Battle of Wallingford I, pitting two of the top teams in Division III.